The imbalance itself didn’t come as a surprise to anyone who has been observing the political scene in recent years, but the degree to which Democrats’ support for Israel has dropped and Republicans’ has risen, as revealed by a recent Pew Research Center survey, was striking. A mere 27% of the 1503 respondents who identified themselves as Democrats told the pollsters they sympathize with Israel over the Palestinians, and 25% said their sympathies lie with the Palestinians. Among self-identified Republicans, those numbers were 79% and 6%, respectively. In 1978, 49% of Republicans and 44% of Democrats sympathized with Israel over the Palestinians. And in earlier years, it was the Democratic party that was perceived as the most supportive of Israel, and the Republican as a less reliable friend. Times, and parties, change. Vital, though, for all of us who care about Israel to remember is that political parties, as has been asserted repeatedly in this space, are not sports teams. It would be mindless, in fact counterproductive, for Jews to become “fans” and brand either party as “pro” or “anti” Israel, and unthinkingly vote accordingly. For what the poll reveals is just that the pool of Americans who are less sympathetic, or hostile, to Israel has gravitated to the Democratic party – not that Democrats in Congress, or Democratic candidates, are in sync with those misguided citizens. Of course, that gravitation is worrisome in itself. But we must remind ourselves that some of Israel’s most stalwart and ardent supporters in Congress are Democrats, and that Congress as a body is unmistakably friendly to Israel and supportive of her security needs. Resolutions and legislation favoring Israel routinely pass both houses of Congress with little to no opposition. And among the 18 states that have passed laws against the BDS movement, nine are blue, nine are red. The Pew survey, moreover, shows that sympathy for Israel remains greater than that for the Palestinians among men, women, whites, blacks, Hispanics, the educated, the uneducated, Protestants, Catholics and even (if at a disturbingly slim margin) Democrats. More concerning to me than the Pew survey, though, are the results of another recent one, from Nashville-based LifeWay Research, which found that, while 77% of older evangelicals – the largest identifiable strongly pro-Israel group –say they support the existence, security and prosperity of Israel, the percentage drops to 58 percent among younger evangelicals, those 18 to 34. “For the most part,” said Scott McConnell, who directs that research center, “younger evangelicals are indifferent about Israel.” That’s not good news. And more disturbing still is yet another recent survey, this one conducted by sociologist Steven M. Cohen and social researcher Jack Ukeles, of 3000 respondents in the Bay Area. Now, the Bay Area isn’t exactly representative of the nation. Were Northern California (my home for 7 years a few decades ago) a state unto itself, its capital would be either San Francisco or Berkeley, whose latitudinarian reputations are legend. But an earlier study of the broader Jewish geographical scene, the 2013 Pew survey of American Jews nationwide, yielded a similarly worrisome portrait of young respondents’ feelings. It, too, found that less than a third of young Jews it asked sympathized more with Israel than the Palestinians. If such young Jewish Americans’ attitude don’t mature, and evangelical support for Israel wanes in tandem, the tight connection between the U.S. and Israel could, chalilah, be threatened. There is, though, a silver lining to that ominous cloud: Us. That is to say, the Orthodox community. We are deeply committed to Israel’s security, and we are poised to become a formidable social and political force on the American scene. 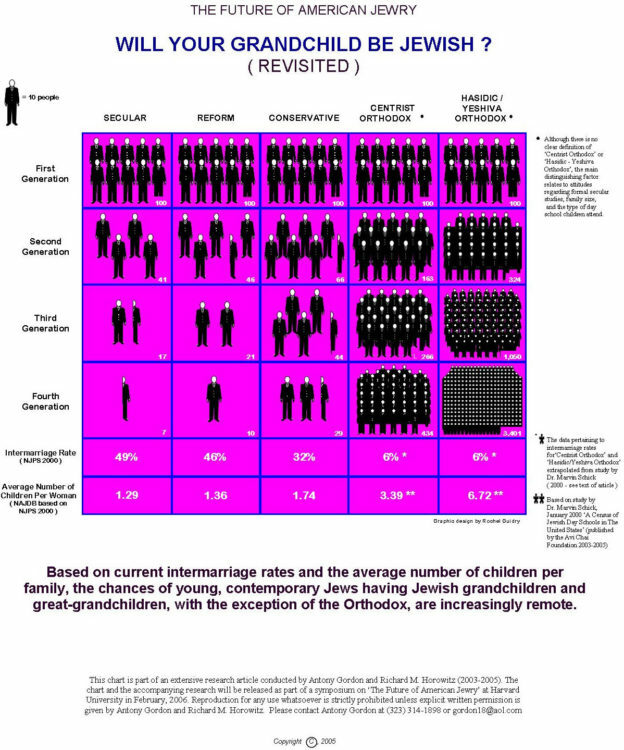 Orthodox Jews already represent more than a quarter of American Jews 17 years and younger. Within the past two generations, according to Professor Cohen, the Orthodox percentage of the American Jewish population has already more than quadrupled. And the trend is, baruch Hashem, continuing. Our young generation, both in its embrace of Torah u’mitzvos and its support for its brothers and sisters in Israel, is the converse of the one the Pew study described. And will be playing a pivotal role in maintaining a continued strong bond between American Jewry and Israel. This entry was posted in Israel, News on February 22, 2018 by Rabbi Avi Shafran.